In chess, the rook can move only forward and backward or from side to side — always in a straight line. 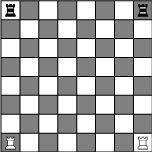 Each player has two rooks to start a match, and each rook is placed in the back corner on either side of the board, behind the left-most and right-most pawns. Figure 1 shows where the rooks go on the chessboard. Figure 1: The starting position of the rooks. No, a rook isn’t a tower, and it isn’t a castle! The rook appears a bit shorter and squatter than the other pieces, which partly accounts for the perception of it as a heavy piece. The rook and queen are sometimes referred to as heavy or major pieces because the rook and its own king, or the queen and its own king, can checkmate an enemy king by themselves. Minor pieces — the knight and the bishop — cannot, by themselves, checkmate an enemy king with only their own king for assistance. The real heavies in chess are the rooks and queens. This heavy thing can be taken too far, of course. The rook is far from a plodding piece, and the player that gets his or her rooks into the game most effectively often turns out to be the winner. In the history of chess, the rook developed from the chariot: It is both fast and strong and therefore of considerable value. Unfortunately, it begins the game tucked into a corner and usually has to wait for the other pieces to settle into their preferred squares before receiving any attention. The rook can move any number of squares — but only in straight lines, up and down, or side to side. Again, think of the chariot. After a chariot gets up a head of steam, turning corners isn’t easy. Have you ever seen Ben Hur? It’s just like that, but without the spikes. The rook has the freedom to move any number of squares horizontally or vertically, as indicated in Figure 2 (on the left). On the right side of Figure 2, you can see that the rook can’t move to a square occupied by one of its own pieces — nor can it jump over the piece and move to any of the other squares along that rank. Figure 2: The rook can move up and down or side-to-side, but it cannot jump one of its own pieces. In Figure 3 (on the left), a white rook and a black rook are ready for battle. The white rook cannot move beyond the black rook along that rank — but it can capture it. A rook thus captures by taking the place of an opponent’s piece: The opponent’s piece is removed and the attacking piece takes its square, as in Figure 3 (on the right). This concept is the same for the other chessmen. Figure 3: Two rooks, charging into battle. But don’t think that you have to capture when given the opportunity. This isn’t checkers! When new players discover the power of the rook, they sometimes decide to move the pawns that are in front of the rooks forward. (These pawns are known as the rook pawns.) This action has the advantage of increasing the space available to the rook, but it is usually a poor way to open the game. The rook must retreat when attacked by an enemy pawn, knight, or bishop because it is too valuable to be lost in exchange for one of them. Time is then lost shuffling the rook to and fro while the enemy pieces come out in force. The best strategy is to move a minimum number of pawns, get the minor pieces (knights and bishops) out, and only then move on to the rooks.